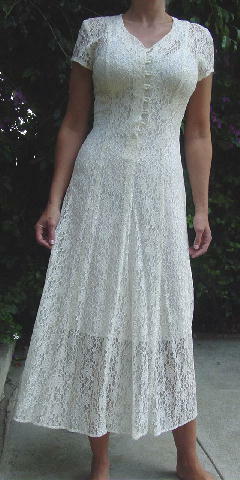 This antique white lace see-through long dress was made in California by All That Jazz. 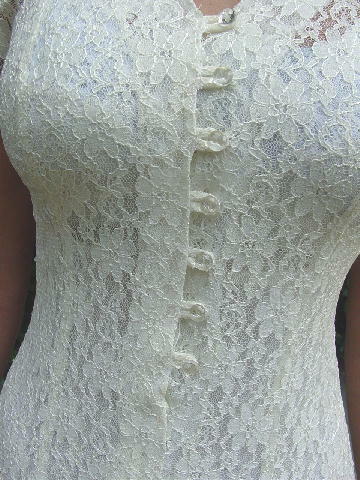 There are seven clear rounded buttons and lace loops down the front upper area. 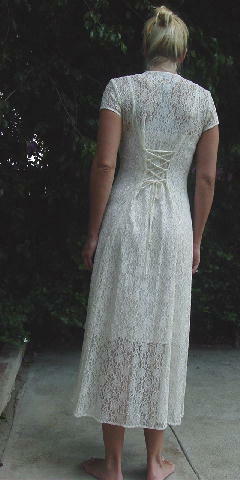 It has a 9" long V neckline and the back has a tie and eight loops, so you can adjust the fit of the waist. A model wore it to a Keith Urban concert. She had worn in in a photo shoot (she was the bride in an outdoor wedding) and liked it so much she bought it from the stylist. shoulder to end of sleeve 5 1/2"
shoulder to hem 50 1/2"
bottom hem side to side 41"